Madrid is the perfect cycling destination both for road bikes and touring bikes. Cyclists can enjoy excellent roads without traffic within close distance of the city itself, in the spectacular surroundings of the mountains of Madrid. 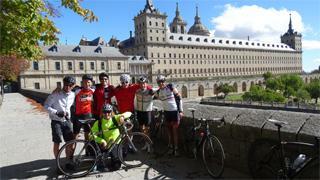 It is also our home here at Bike Spain Tours and we love to share its beauty, history and hidden charms with visitors. Our capital city is vibrant and bustling with culture, art and magnificent architecture and is only a stone’s throw away from spectacular mountain passes and incredible royal monuments, all of which are best experienced by bike. 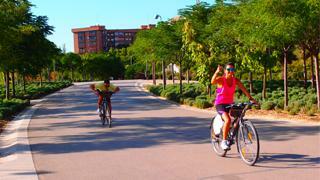 On any of our Madrid biking tours you will truly experience the best of what Madrid and its surroundings have to offer! From the ancient Roman aqueduct in Segovia to the imposing Gothic cathedral of Toledo and the impressive royal site at El Escorial, you will understand why this area has been given so much recognition by UNESCO for its World Heritage Sites. And while exploring the region by bike, you will also discover some hidden gems that are off-the-beaten track. 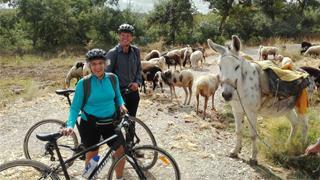 Whether you choose to cycle with other like-minded adventurers on one of our guided trips or you opt to explore Madrid at your own pace on our self-guided itinerary, you can expect to stay in the most charming hotels, sample the finest of Castilian food and wine and have all the other details taken care of by the team at Bike Spain Tours. Please click on the tour of your interest to see the options. Discover Alberto Contador's home town Pintor, Carlos Sastre and his foundation in Avila, Pedro Delgado and his love for Segovia, Bahamontes and his treasured Toledo. 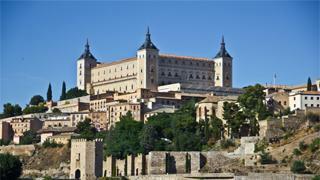 Discover six hundred years of Spanish history on two wheels and in luxurious accommodations!